As with the Demon Slices I took along these Spooky Cupcakes to our weekly Friday games night and shared them out as we played. 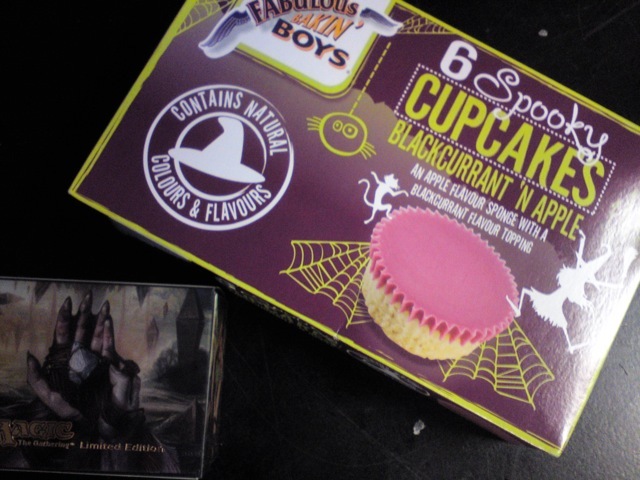 As this week was a bit more rushed I forgot to get a picture of the individual cakes, but they look the same as all the other Bakin' Boys range - they didn't even have themed cupcake cases! They do however come in little bags which have 'trick or treat' themed activities like eating only the sponge or while balanced on the back of your hand, but these suggestions were mostly ignored! The sponge's flavour wasn't noticeably that different from the normal vanilla sponge, and if I hadn't checked the box I'd have forgotten that it was supposed to be special. The purply-pink topping was a delight and is the usual fondanty not chocolaty topping that annoys a few people, but delights others like me. It wasn't amazing enough to declare these better than the orange topped vanilla ones, but it was certainly a nice change. As with the Kipling Halloween treats I feel that maybe a little more effort could have been added - even just a rice paper shape in the centre of the cake - to differentiate these from the regular fare. I have a second box for closer to the date of an alternate seasonal flavour too.